Artist's rendition of NASA's OCO-2 satellite in orbit. OCO-2 launched on July 2, 2014 and made its first science measurements a month later, on Aug. 6. NASA is gearing up for next month's launch of a spacecraft that should help scientists better understand the drivers behind Earth's changing climate. 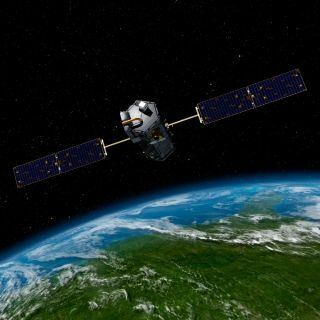 The agency's Orbiting Carbon Observatory-2 satellite (OCO-2) is in final preparations for its July 1 liftoff from Vandenberg Air Force Base in California. The mission is designed to provide a comprehensive look at atmospheric levels of carbon dioxide, the heat-trapping greenhouse gas thought to be responsible for much of the warming trend observed on Earth recently. Once aloft in a polar orbit 438 miles (705 kilometers) above Earth, the satellite will use its single scientific instrument (a grading spectrometer) to make hundreds of thousands of such measurements every day, with an anticipated precision of 1 part per million of carbon dioxide, Edwards added. The resulting data will shed new light on Earth's carbon cycle, identifying natural and manmade sources of CO2 as well as the "sinks" that pull the gas out of the air, researchers said. "The OCO-2 mission will collect … measurements with the accuracy, coverage and resolution that we need to answer these important questions about where carbon dioxide is being absorbed and released in the natural global cycles across the globe," said Annmarie Eldering, mission deputy project scientist at NASA's Jet Propulsion Laboratory (JPL) in Pasadena, California. The two-year OCO-2 mission is quite a bit more expensive than its star-crossed predecessor — $465 million, compared to $275 million for OCO. The cost increase results partly from NASA's decision to use a different, larger rocket — the United Launch Alliance's Delta 2 — for OCO-2, Edwards said. The process of selecting a new rocket and understanding the implications of the choice also caused a delay of a year or so, which bumped the pricetag of OCO-2 up further still. Carbon dioxide levels in Earth's atmosphere are currently about 400 parts per million — the highest they've been in at least 800,000 years, NASA officials said. Humanity is responsible for much of this buildup, pumping out about 40 billion tons of the gas every year by burning fossil fuels and slashing and burning forests, among other activities. This level of production is too much for the planet's sinks, which remove just 20 billion tons of CO2 on average every year, researchers said. Oceans are major sinks, but a great deal of mystery surrounds the sinks on land. "Knowing what parts of Earth are helping remove carbon from our atmosphere will help us understand whether they will keep doing so in the future," Michael Gunson, OCO-2 project scientist at JPL, said in a statement. "Understanding the processes controlling carbon dioxide in our atmosphere will help us predict how fast it will build up in the future," he added. "Data from this mission will help scientists reduce uncertainties in forecasts of how much carbon dioxide will be in the atmosphere and improve the accuracy of global climate change predictions." World leaders are currently discussing and debating how to deal with climate change, and what to do about rising CO2 levels. OCO-2 officials hope the mission's data can help advance and inform this discussion. "We would also be hoping that policymakers might use some of this information to, for example, start to look at the impact of some of the emission-reduction activities that go on, or deforestation, and understanding what's happening globally," Edwards said. OCO-2 is the second of five NASA Earth-science missions to launch in 2014, after the Global Precipitation Measurement Core Observatory, which lifted off Feb. 27. The agency also plans to launch the free-flying Soil Moisture Active Passive satellite, as well as ISS-RapidScat and the Cloud-Aerosol Transport System — two instruments designed to be installed aboard the International Space Station —later this year.